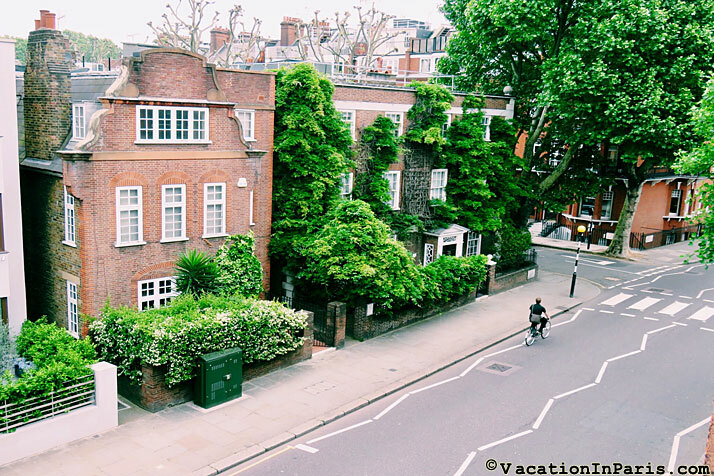 Enjoy old world charm in central London. 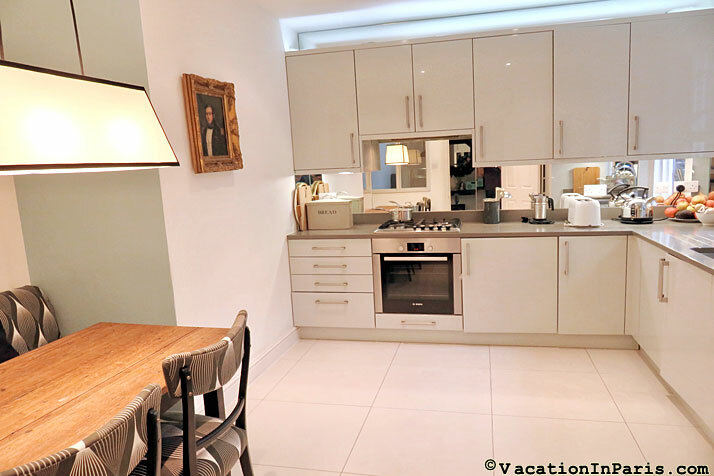 This stylish apartment is ideally located in Chelsea, former neighbourhood of Oscar Wilde and Mark Twain. 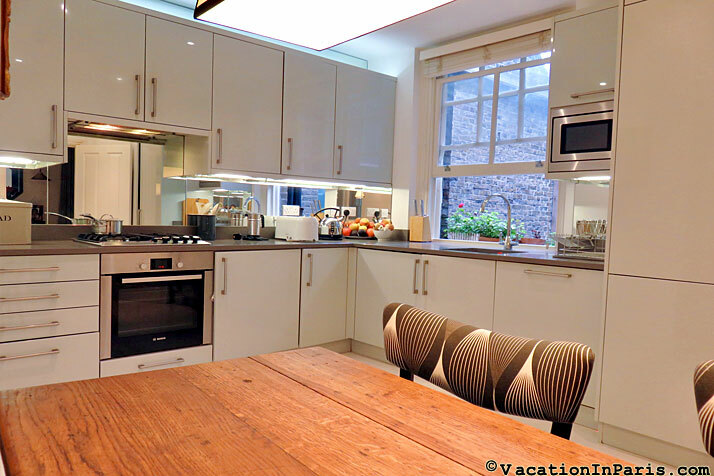 It’s only 800 meters from the Sloane Square tube station and a five minute walk from the fashionable King’s Road. 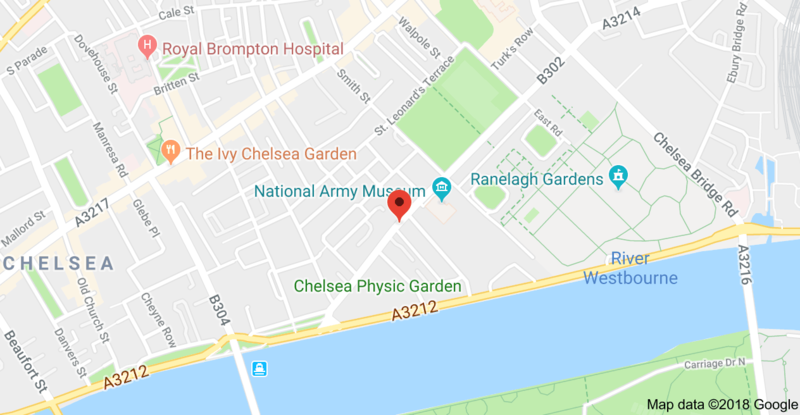 It's also near the river Thames and the Chelsea Physic Garden, this location is perfectly situated in order to explore the wonderful city of London in the most efficient way. 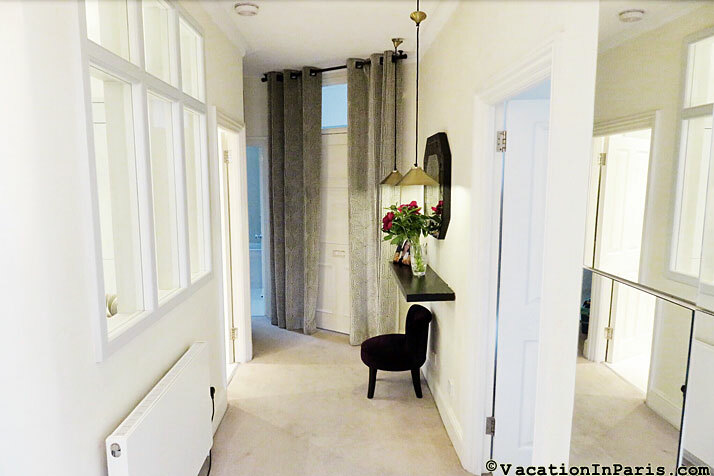 This luminous apartment is a large 75 m2 (about 802 ft2) and located on the 2nd European floor (3rd US) in a walk up of an antique Victorian house, offering you both old world charm and modern comfort. 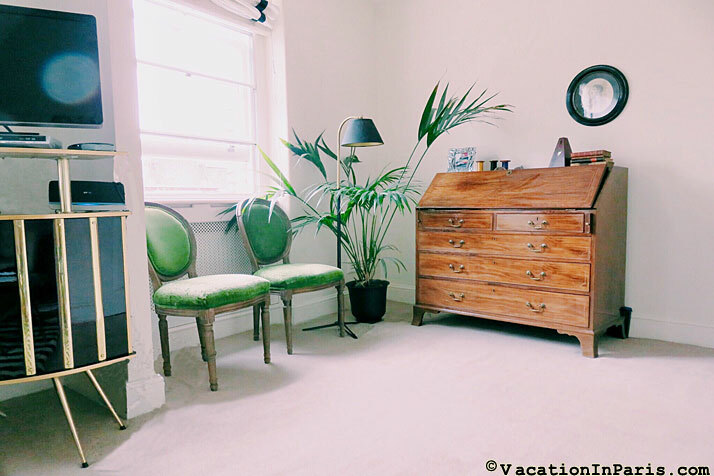 There’s a feeling of luxury in this apartment with its earth colors, its mirrors and its pale carpeting. Appointed with quality furnishings and all the comforts you’re accustomed to, this is a place for relaxing as if it were you own home. With two bedrooms and two bathrooms it’s ideal for two couples or a family, large enough to provide everyone with enough private space. The hallway takes you from the entryway to each of the rooms. 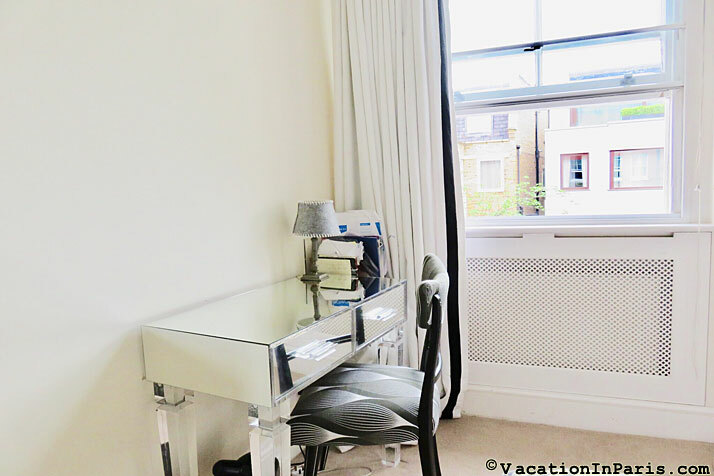 Mirrors and windows add light, creating a unique and stylish atmosphere. 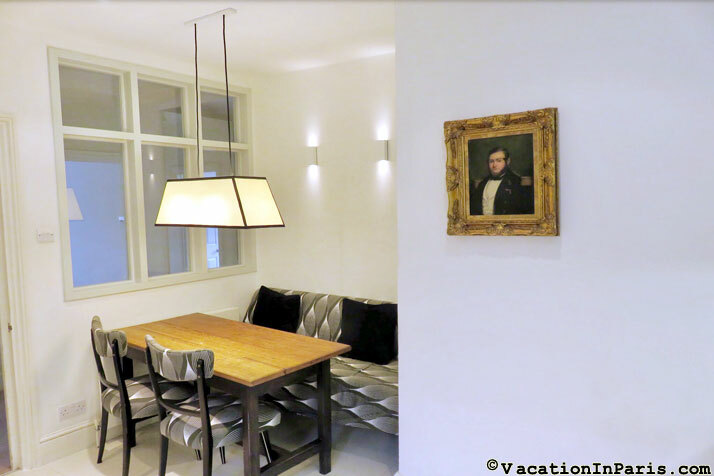 The white walls, the portraits in gilded frames, the black and white lithographs over the fireplace, and the choice of colors, make the apartment handsome and refined. 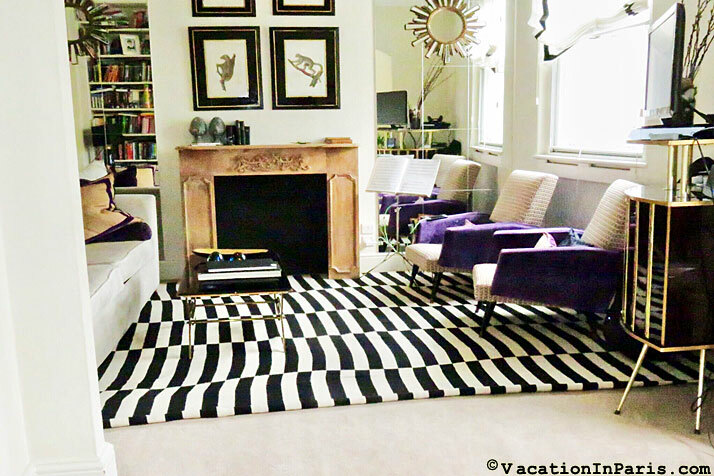 The décor is eclectic, a mixture of modern and classical, but all tastefully arranged. The cozy living room is furnished with a couch and two armchairs. 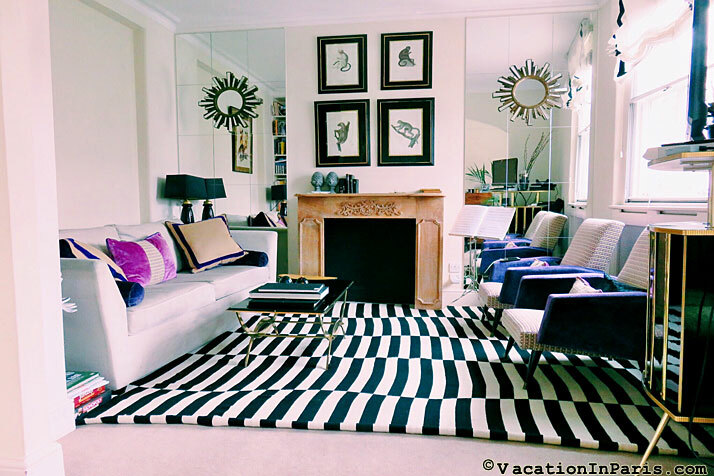 It feels cosy with its black and white striped rug, the fireplace and of course the colorful cushions. What a great way to relax after a day out in the city. The sofa can turn into a queen bed. So useful if there’s a fifth person! 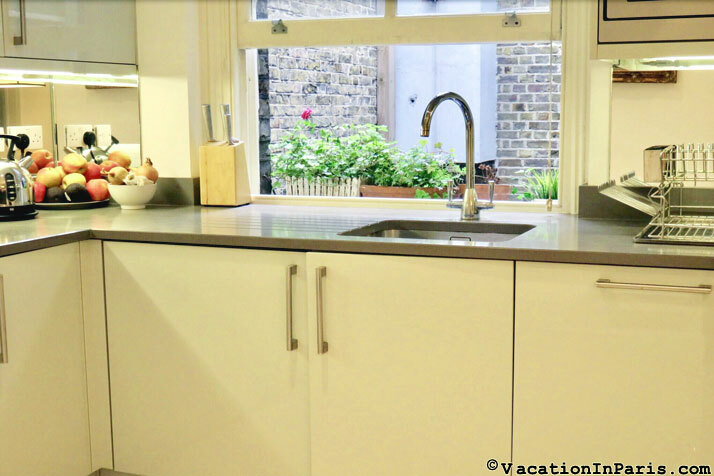 Down the hallway there is the large kitchen which is fully equipped with an oven, gas stove top, microwave, dishwasher and just about everything you’ll need to prepare your meals. There’s even a washer/dryer combo. 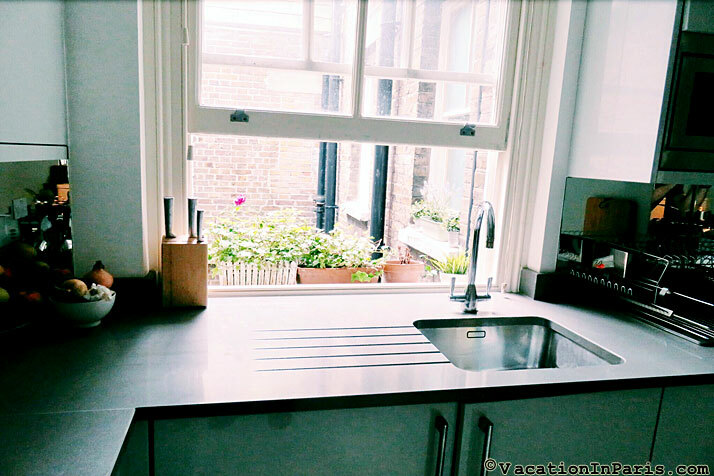 A nice sized window over the sink adds to the already open feeling of the room. 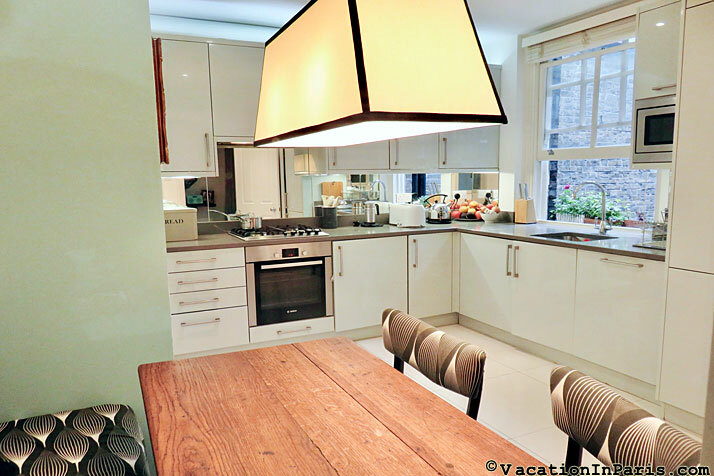 On one side of the kitchen is a dining nook where you can enjoy your delicious meals with a wooden table surrounded by a padded bench and two matching chairs. You’ll find the two bedrooms down the hallway. The design of the master bedroom is chic with its black and white designer paneling behind the queen bed and patterned bedding. 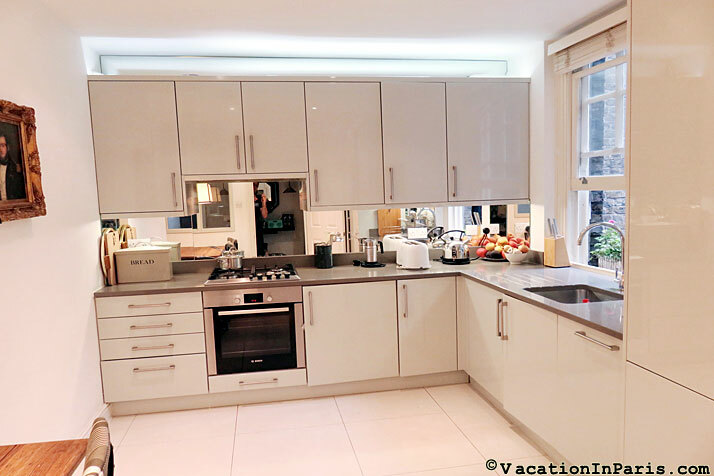 Two large English-style windows bring in lots of light but the double glazed windows and thick curtains keep the noise and light out for a sound sleep. 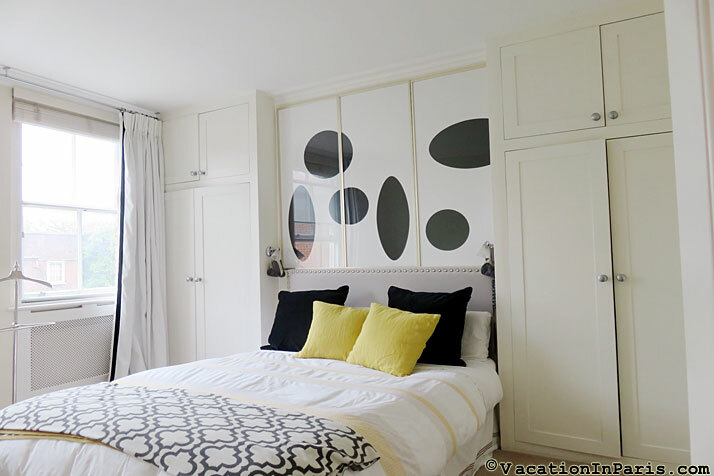 A mirrored desk and chair, lots of closet space, the cozy bed, all with oodles of charm, make this bedroom satisfying to retire to after a long day out. To top it off, this room has an en suite bathroom. 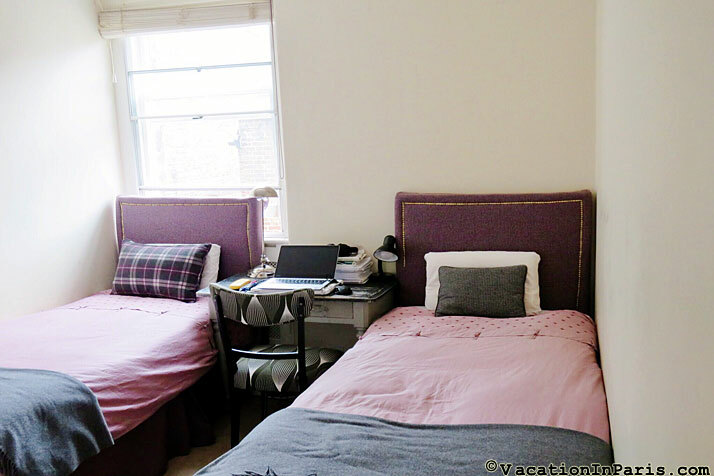 The second bedroom is smaller with two twin beds, which can be joined together to form a queen. Kindly let us know your preference at the time of booking. 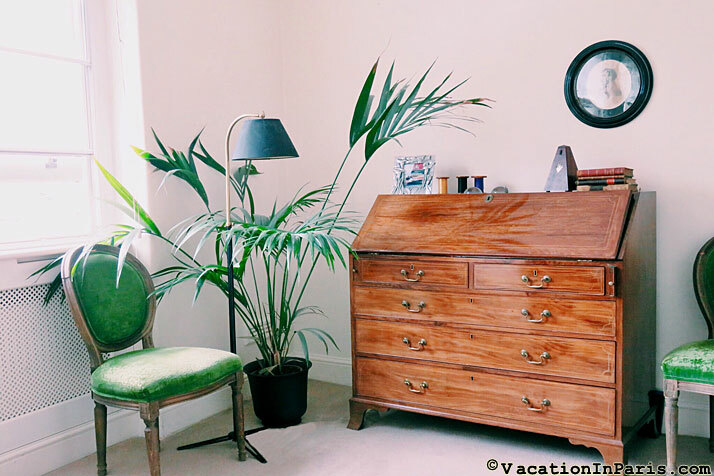 A window and desk make this room perfectly suitable for sleeping or getting away and checking your emails. How convenient to have two bathrooms - one has a bathtub, sink and WC, with a large window which lets light in as well as a nice breeze. The second bathroom is smaller with a shower, WC and sink. Come enjoy the best of London!